Just for fun. 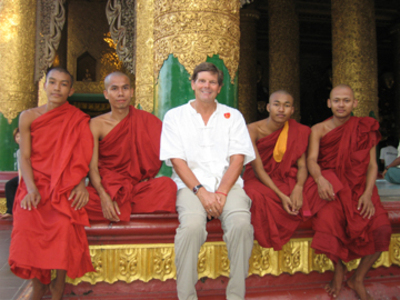 This is a recent photo of me and four young monks at the Schwedegon temple in Rangoon, Burma (officially Yangon, Myanmar). I joked with them that we could be be a basketball team (I would've been the center -- I'm 1.86m -- and they were considerably shorter). They thought it was funny. In Burma and Thailand, it's quite common for young men between the ages of 18 and 22 years old to take anywhere from 3 to 6 months off to live as monks in a monastery. They shave their heads, and don orange robes. Each day they fast after noon, reflect on life, chant, pray and meditate, and serve the needs of their monastery. After their stint, they return to society with a different perspective. I wonder how different my life and thinking would have been had I taken a year off after high shool to do something similar.